This 100% organic mattress topper is a wonderful alternative to sheepskin and the softness is unmatched. 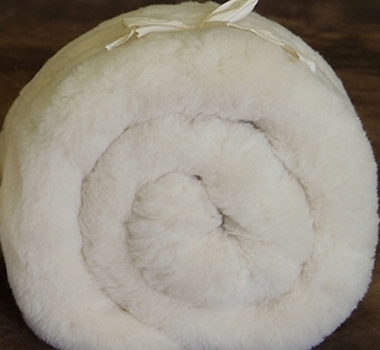 Happy Lamb Fleece features cloud-soft exposed wool woven into an organic cotton backing. It is very therapeutic for anyone who has to spend a long time in bed (i.e. bed sores) and can be helpful for people dealing with fibromyalgia. It is incredibly healing, breathable and great for circulation. The wool in this product is sourced in the Pacific Northwest of the United States from farmers who participate in the Sustainable Wool Program, producing high quality ultra clean wool from sheep flocks that are managed in a humane ethical way and in a chemical-free thoughtful environment.